unfair dismissal and anti-union conduct by management. be filled and confirmation of the trade union rights of workers. achieves results in the interests of our members. 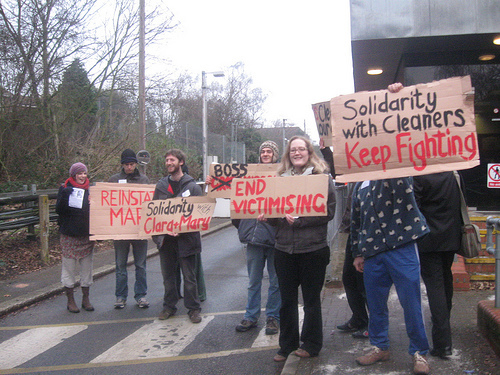 The message to cleaners across London is clear â€“ donâ€™t live in fear â€“ get organised! Friday 19th August 2011, 5.00pm-8.00pm Heron Tower, 110 Bishopsgate, London. According to its own website, the recently opened “social centre” that is the Heron Tower has “visionary ideas and innovative features brings great benefits to the tenants and to the cityâ€. Yet the cleaners who work in the â€œtallest building in Londonâ€ endure low pay, bullying and hypocrisy. On 2nd May, this year, the â€œLondon Living Wageâ€ hourly pay rate was set by the GLA at Â£8.30, however cleaners working for LCC Support Services Ltd are currently being paid less than this. In June, workers complaints were ignored until their union, and the Industrial Workers of the World (IWW), intervened. At this point, LCC management accepted the cleaners should be receiving the Living Wage and promised to rectify this. One month later, the company still have yet to fulfil their promise. On Monday 1st August 2011, the IU640 Cleaning & Allied Industries Branch of the IWW, entered a collective grievance on behalf of workers who have found out the cost of daring to ask for a decent living â€“ increased workloads and reduced working hours. For cleaners who are already hard working and low paid, this was and is deeply painful. LCC have so far ignored their employees, met their calls to resolve this legitimate grievance with silence. They have also refused to participate in any collective bargaining procedures. In response to the arrogance of this company, IWW union member cleaners and supporters will rally and demonstrate outside Heron Tower from 5pm, today, Friday 19th August. It is time Gerald Ronsen, the billionaire owner of Heron Tower and â€œgenerous philanthropistâ€, intervenes, ensuring the workers in his building receive their fair share of the so-called â€˜great benefitsâ€™ this building has promised London. There will be banners and placards of the IWW Trade Union IU640 Cleaning & Allied Industries Branch and opportunity for photos.